So why is Microsoft support not using Vista? 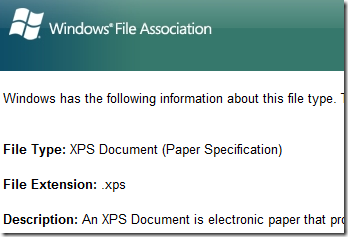 Secondly, when opening an unknown file type, Windows default file type unknown dialog would point them to the the page http://shell.windows.com/fileassoc/0409/xml/redir.asp?EXT=xps, which clearly states what it is and what they need to do. So I sent an email to the XPS team about my issue, and got very polite replying saying thanks for the interest and feedback, and they are following up the issue with the teams involved. Let’s hope they do. XPS from a .NET developers perspective is just brilliant. Even if the format is not as featured or whatever as PDFs, the ease of creation due to the XAML declaration is just too easy to ignore. Not to mention the Adobe Reader (currently version 9.1 and 41.1MB!) is way too bloated (use Foxit Reader, version 3.0, 3.26MB). The issue holding XPS up is that is it not in wide enough support yet. I have sent them to family and friends and get the same type of reply from them, as I did from Microsoft support. Hopefully with more applications using .NET 3.0 and Windows Vista & 7 adoption on the increase, this will be resolved soon. Then, as a developer, I can say goodbye to painful PDF creation. On a positive note, Microsoft support was very good. Very fast responses and when I sent the print out as a PDF my issue was very quickly resolved. Aside: Same issue with internal adoption of Microsoft’s standards. 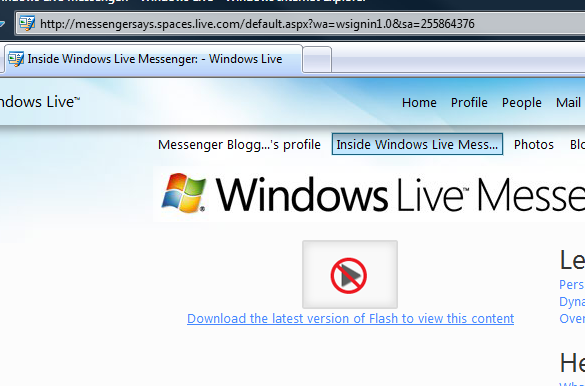 The Inside Windows Live Messenger blog, has flash at the front, instead of Silverlight. I would have thought, since Messenger 9 has sprinkles of WPF, Silverlight would be a no brainer.